The Good: The action scenes were nicely done and Matt Damon does his job. Fight scenes were shot really well and made good use of the slow motion, rotational camera shots. (Something Man of Steel could've benefited from using) Surprisingly enough, this was more graphic than expected. There quite a few body parts flying around and "explosive" scenes that keep you engaged. Also the futuristic weapons were pretty interesting, cool to watch, and believable. Finally, the overall theme of the movie, the rich class vs the poor class, is a very intriguing one since this movie ventures to visually demonstrate a potential glimpse of the future. The Bad: The character development seems weak. Outside of childhood relationships, the "love interest" just doesn't seem very strong. That weak development causes a good amount of slow parts in the movie. (Luckily the action scenes wake you right back up) Lastly, many characters come from different backgrounds, which means they tend to speak different languages, and have heavier accents. There are a few times when characters get a little too excited and their strong accents make it difficult to understand what they are saying. Granted you'll still get the gist of what they are saying, but I could see that being annoying for some people. The Reason: The director gives you an authentic, gritty, futuristic atmosphere from beginning to end. This film is like District 9 + Oblivion...just minus the aliens. 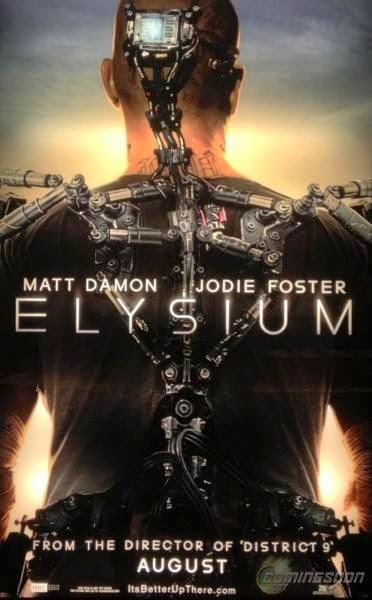 If you enjoyed either of those movies, then you'll more than likely enjoy Elysium as well. This wasn't regrettable to watch, but this isn't going to really stand out compared to other movies released this year. So-So theater watch, or a good rental.